14. 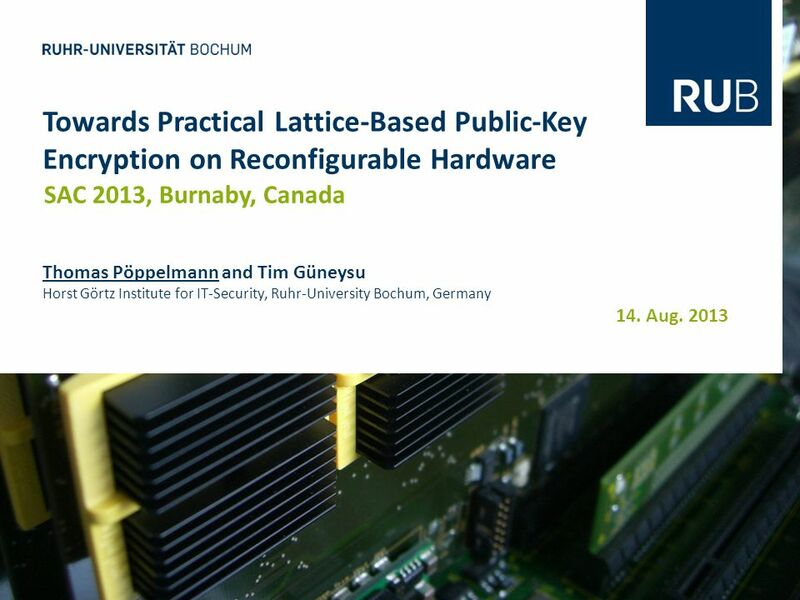 Aug. 2013 Towards Practical Lattice-Based Public-Key Encryption on Reconfigurable Hardware SAC 2013, Burnaby, Canada Thomas Pöppelmann and Tim Güneysu. 21 14. 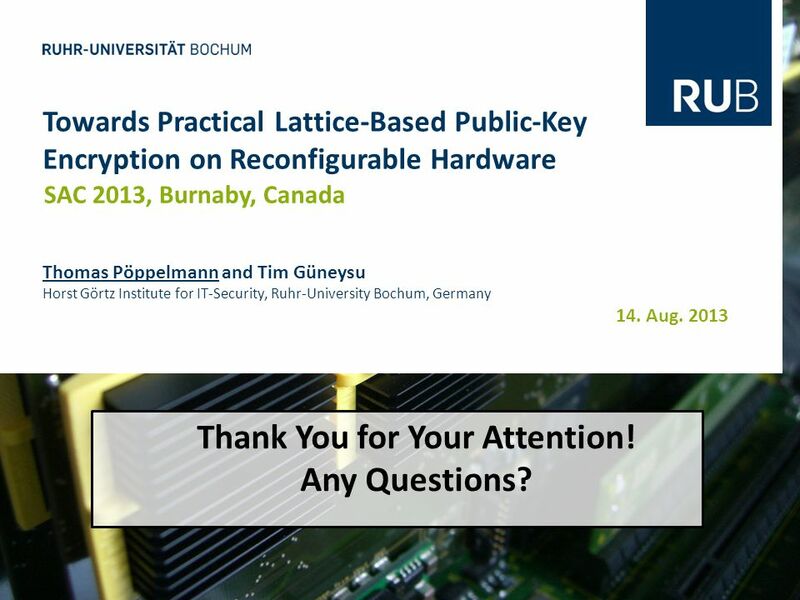 Aug. 2013 Towards Practical Lattice-Based Public-Key Encryption on Reconfigurable Hardware SAC 2013, Burnaby, Canada Thomas Pöppelmann and Tim Güneysu Horst Görtz Institute for IT-Security, Ruhr-University Bochum, Germany Thank You for Your Attention! Any Questions? 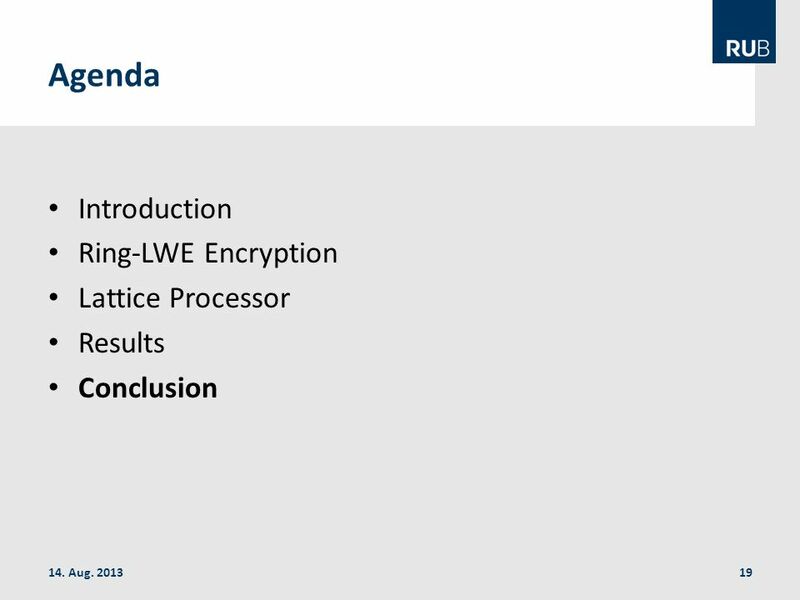 Download ppt "14. Aug. 2013 Towards Practical Lattice-Based Public-Key Encryption on Reconfigurable Hardware SAC 2013, Burnaby, Canada Thomas Pöppelmann and Tim Güneysu." 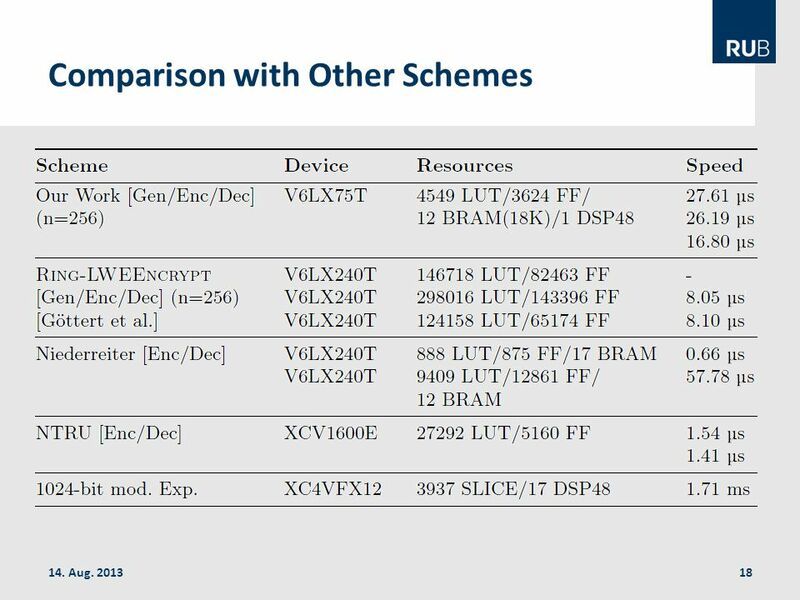 FPGA and ASIC Technology Comparison - 1 © 2009 Xilinx, Inc. All Rights Reserved FPGA and ASIC Technology Comparison, Part 2. 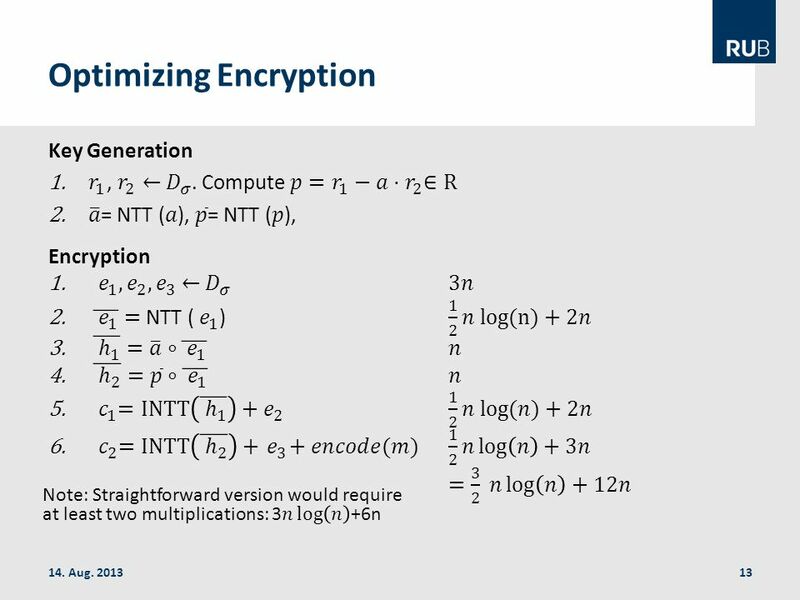 Subthreshold SRAM Designs for Cryptography Security Computations Adnan Gutub The Second International Conference on Software Engineering and Computer Systems. 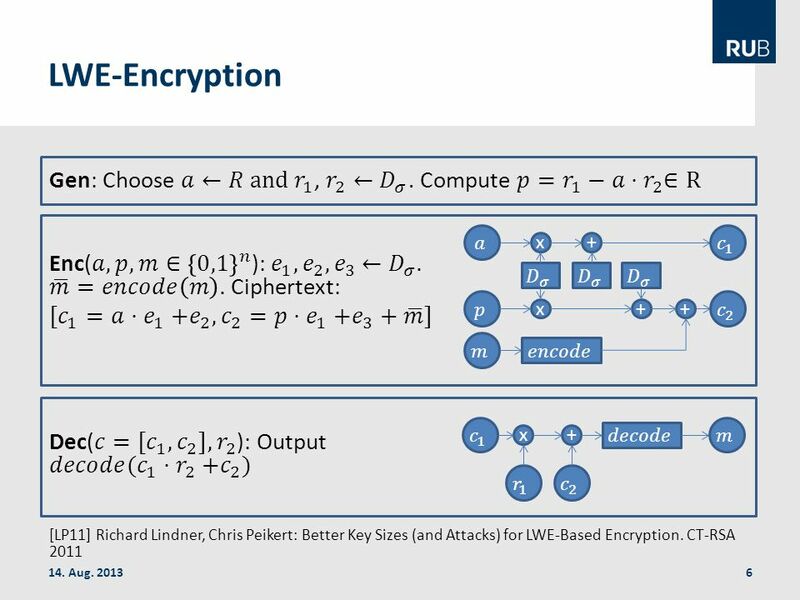 Are standards compliant Elliptic Curve Cryptosystems feasible on RFID? 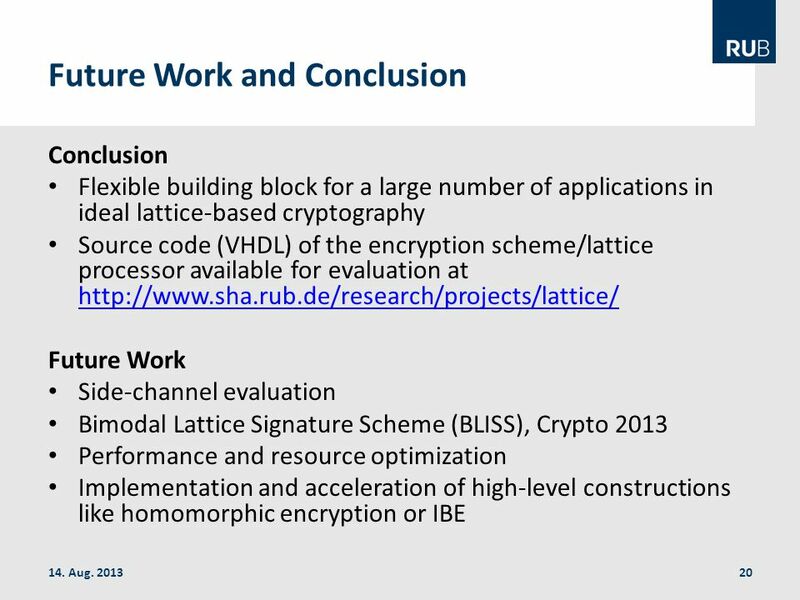 CryptoBlaze: 8-Bit Security Microcontroller. Quick Start Training Agenda What is CryptoBlaze? KryptoKit GF(2 m ) Multiplier Customize CryptoBlaze Attacks. 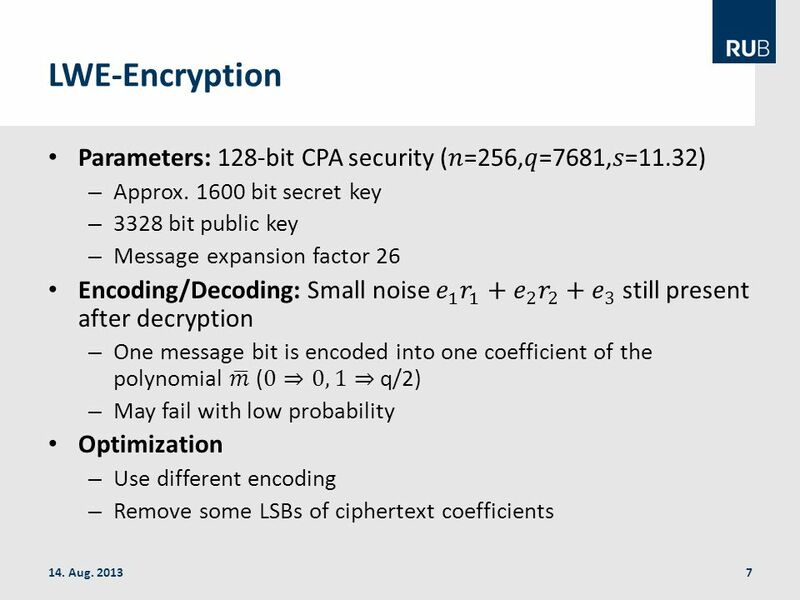 TIE Extensions for Cryptographic Acceleration Charles-Henri Gros Alan Keefer Ankur Singla. 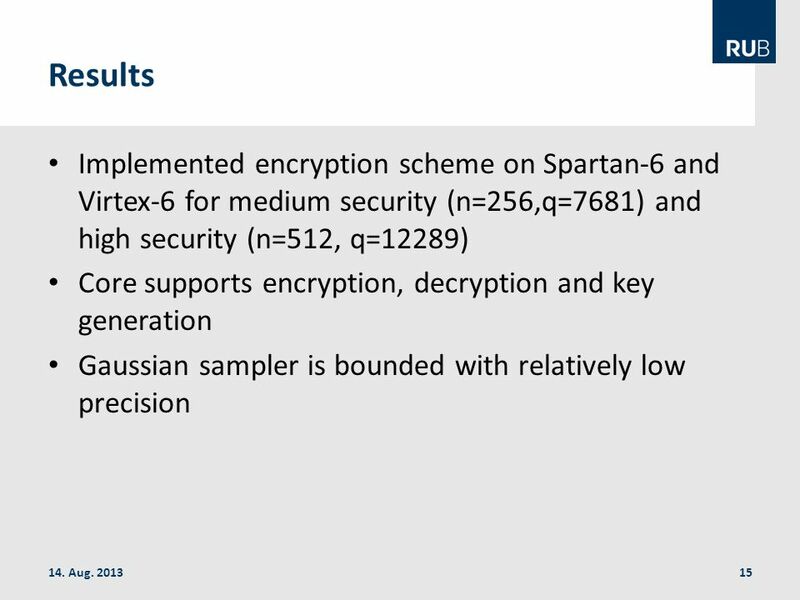 1 SECURE-PARTIAL RECONFIGURATION OF FPGAs MSc.Fisnik KRAJA Computer Engineering Department, Faculty Of Information Technology, Polytechnic University of. Graduate Computer Architecture I Lecture 15: Intro to Reconfigurable Devices. 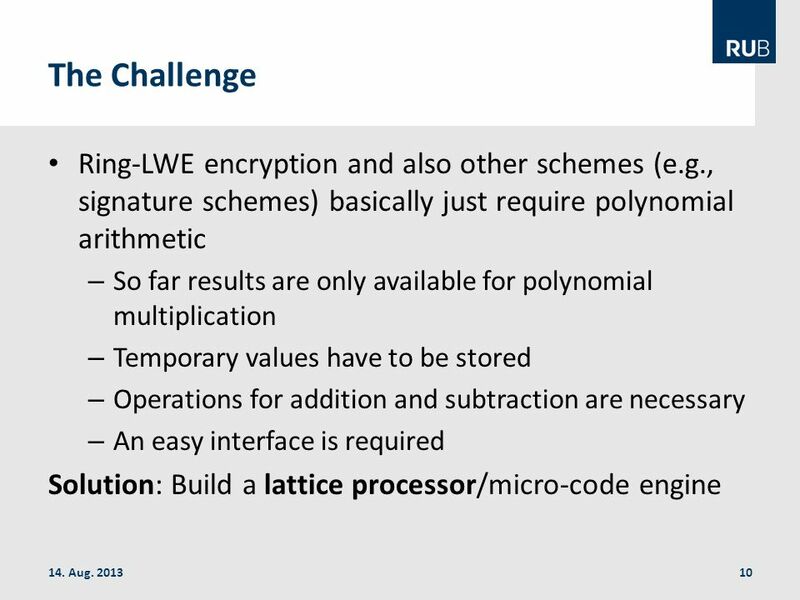 Digital Signal Processing and Field Programmable Gate Arrays By: Peter Holko. Zheming CSCE715.  A wireless sensor network (WSN) ◦ Spatially distributed sensors to monitor physical or environmental conditions, and to cooperatively. 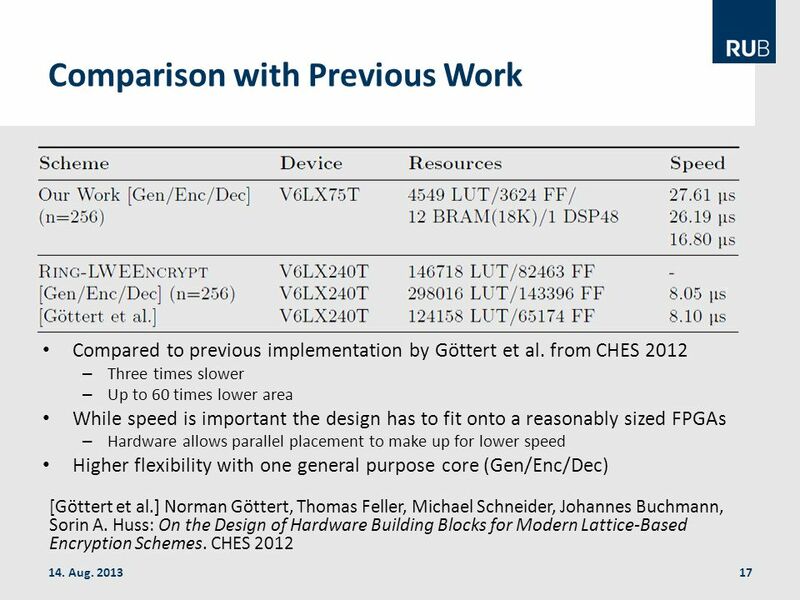 Lecture 26: Reconfigurable Computing May 11, 2004 ECE 669 Parallel Computer Architecture Reconfigurable Computing. 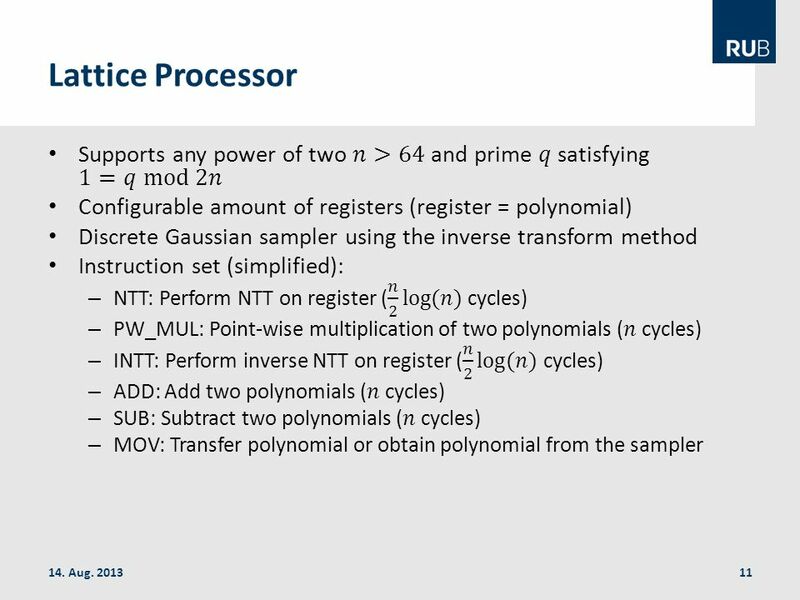 FPGA chips and DSP Algorithms By Emily Fabes. 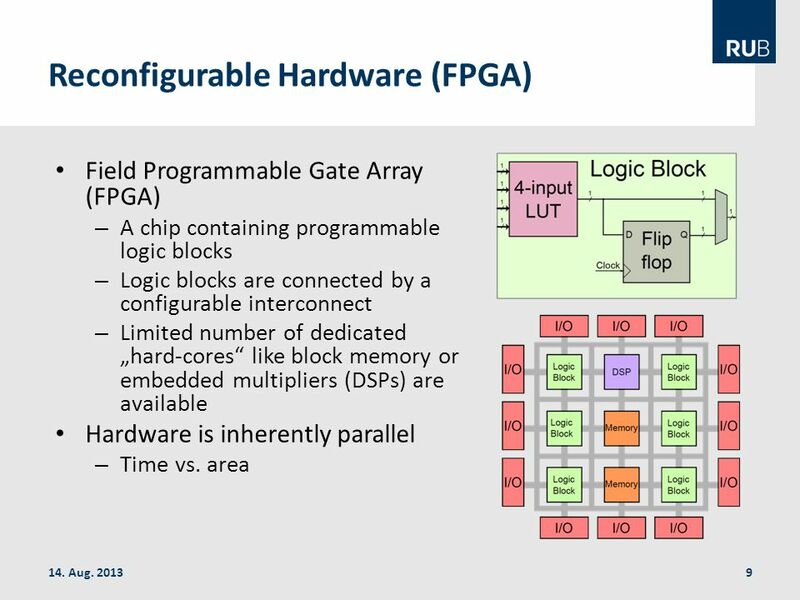 2 Agenda FPGA Background Reasons to use FPGA’s Advantages and disadvantages of using FPGA’s Sample VHDL. Design of a Reconfigurable Hardware For Efficient Implementation of Secret Key and Public Key Cryptography. 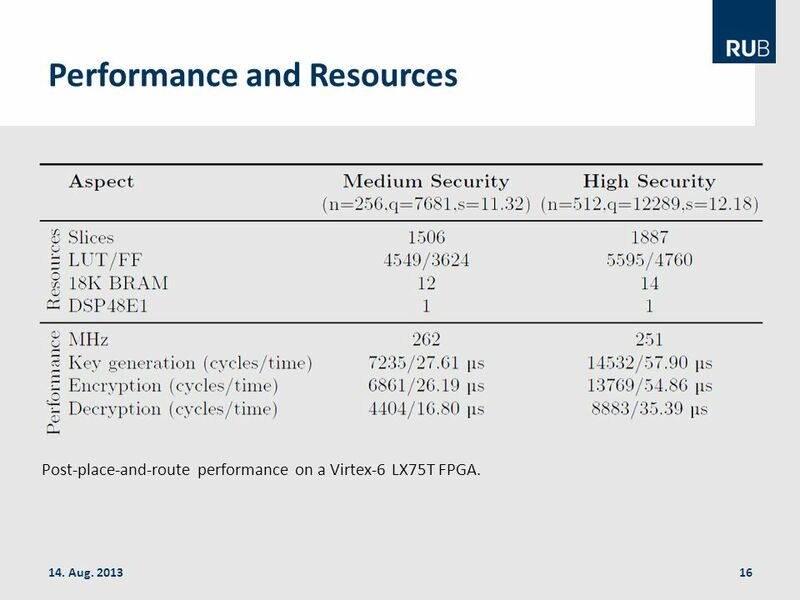 Video on DSP and FPGA John Johansson April 12, 2004. 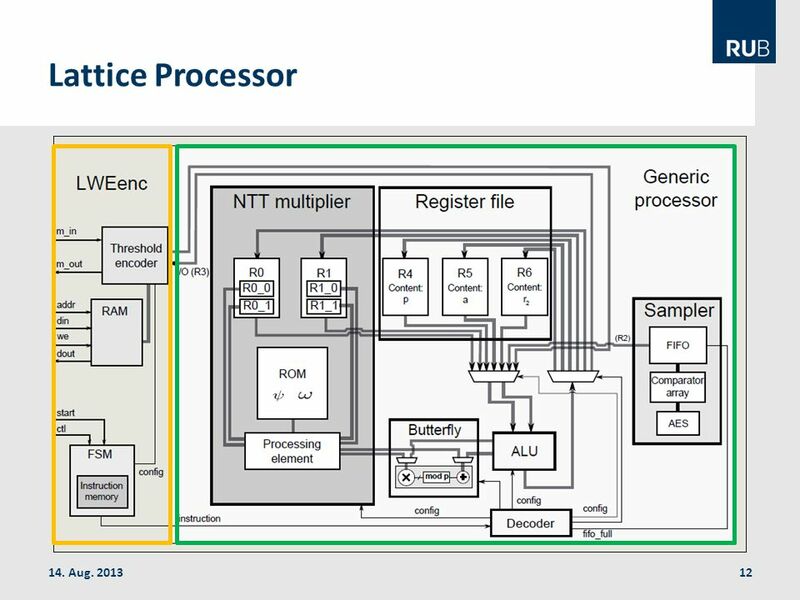 Technion – Israel Institute of Technology Department of Electrical Engineering High Speed Digital Systems Lab Project performed by: Naor Huri Idan Shmuel. 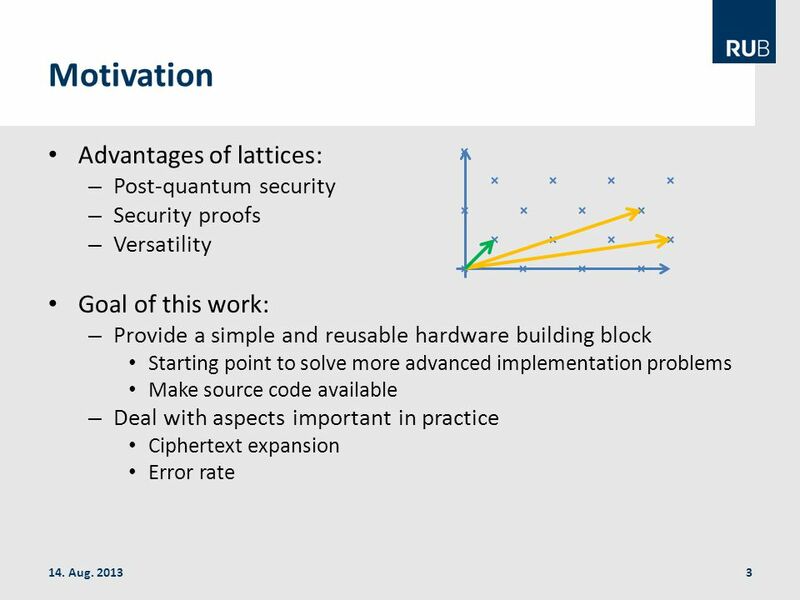 Thomas Pöppelmann Hardware Security Group Horst Görtz Institute for IT Security 05.06.2015 Implementing Lattice-Based Cryptography.